Motorists should expect delays during the work, which will run Feb. 4 though March 5. Construction has begun to install a new sanitary sewer pump station west of King City. 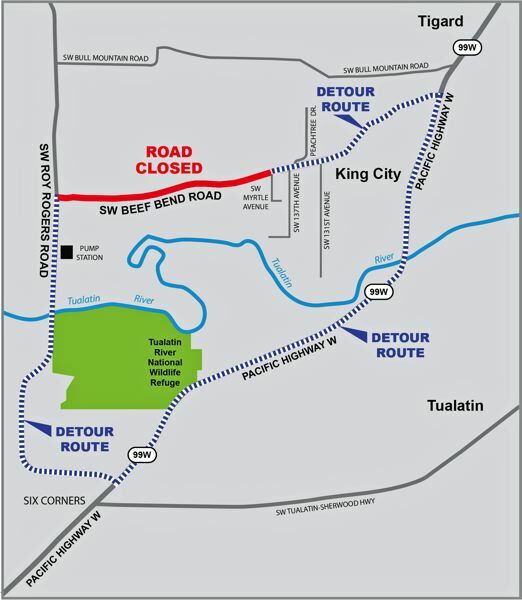 The work will require a temporary road closure for Southwest Beef Bend Road from starting Monday, Feb. 4, and continuing through March 5. As part of this construction, drivers should expect delays and longer commutes due to detours. The $7.2 million project will serve portions of the Bull Mountain, South Cooper Mountain and River Terrace development areas, including areas within Urban Reserves adjacent to the cities of Beaverton, King City, Tigard and unincorporated Washington County.